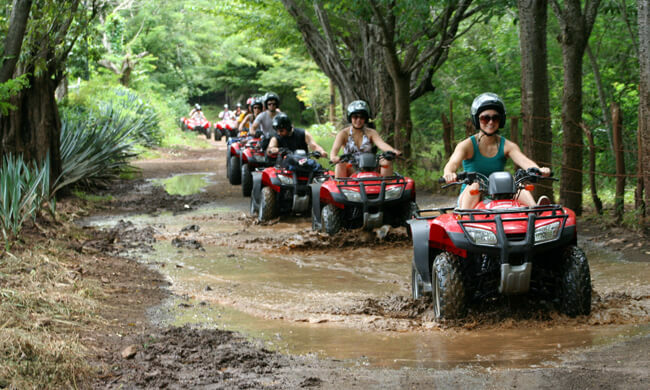 See Waterfalls & Explore the Rainforest while Driving an ATV! Manuel Antonio is where the ocean meets the rainforest, one of the most stunning areas of Costa Rica. The ATV tour gives you the opportunity to explore the area in an adventurous way by driving along unpaved roads through African Palm plantations, cattle farms, and traditional Costa Rican towns. A great tour for anyone looking for some off-the-beaten-track adventure and interested in discovering the natural beauty of the rainforest. Your tour begins when you are picked up from your hotel and driven 20 minutes to the start of your adventure. Your local bilingual guide with go through the necessary safety instructions and fit you with your helmet. You will then have a chance to practice on your fully equipped Honda ATV before heading off over rugged mountains and through tropical forests. Halfway through your journey, you will leave your ATV and take a short nature hike through the impressive primary rainforest spotting wildlife like monkeys, sloths, iguanas, and an array of colorful tropical birds passing waterfalls where you can swim in several natural pools. Back on your ATV speeding along the unpaved roads until you reach Finca Anita, a local cattle farm house where you will enjoy a traditional Costa Rican meal while taking in the mountain views and tropical forest all around you. Please note: Children under 16 not allowed to drive an ATV, they are allowed only as an extra passenger. Includes: Round trip transportation, safety equipment (helmets), meal, beverages. Be sure to bring weatherproof clothes, sunscreen, and a case for your camera.